Heather Wardell, Women's Fiction: Alpaca and silk, oh my! Alpaca and silk, oh my! Made from Blue Sky Alpacas Alpaca and Silk yarn, these mitts are warm. The pattern comes from the Crochet Liberation Front's book (which I recently bought electronically and love). 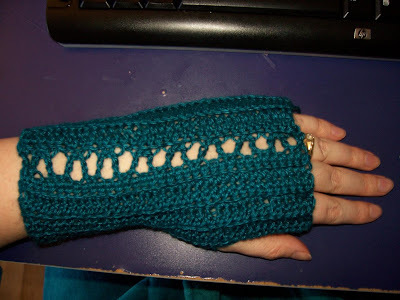 They were incredibly easy to make, and they have a nice shape to the wrist that I haven't seen done in any other mitts and yet it was easy as well. I'm amused by the fact that the pattern is called Joanna Fingerless Mitt, because one of the agents currently looking at Raoul is named Joanna. A good sign? Perhaps. Ravelry types, the pattern has a page there, of course. I have developed something of a bad addiction to fingerless mitts. That's not bad, is it? I mean, I could quit whenever I wanted. YOur mitt looks great and I'll keep my fingers crossed for you. March 23, 2009 at 9:58 a.m.
Wow, they are great!! Of course, you can quit, but why would you want to? Especially while using Alpaca and silk! March 23, 2009 at 3:01 p.m.
March 25, 2009 at 9:15 p.m.
March 26, 2009 at 9:35 p.m.